Zadní brzdový buben konverze 4 x 130 mm na 5 x 205 mm levo/pravý 1ks. Pokud máte Brouka, nebo Karmann Ghiu, která má 4 otvory pro bubny a požadujete rozteč 5 x 205 mm (která je předvrtaná na šrouby), zde je perfektní řešení. Nemusíte použit podložky viz. související zboží. Buben je navíc oproti standardu, dostatečně zesílený. 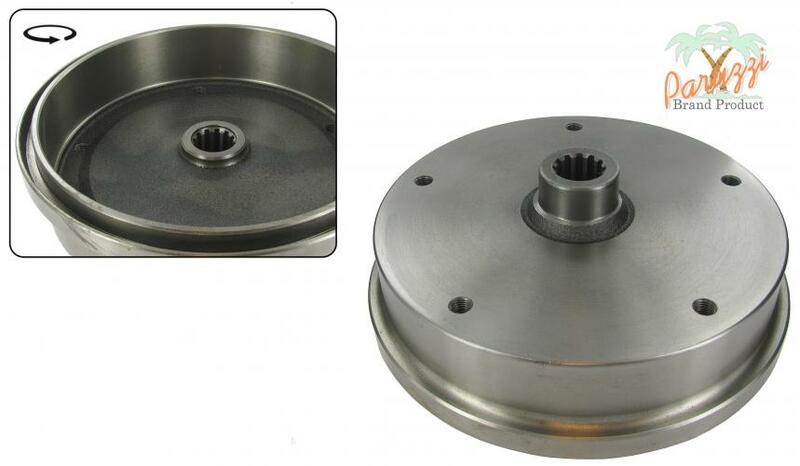 Brake drum rear convert 4 x 130 mm to 5 x 205 mm left/right each. Converting drum 4 to 5 holes, if you have a Beetle or Karmann Ghia has 4 holes drums (from 8/1967 and later) and you want the older 5 holes (5 x205 mm) Rims without the use of adapters, then here is the perfect solution. This drum is equipped with the 5 holes 205 mm pitch and will only fit the Beetle and Karmann Ghia from 8/1967 and later, so that standard 4-hole rims are fitted. The drum is not like the original 5 holes only strengthened where is the bolt holes are but the total surface, this makes the drum a lot stronger than the original and possibly another rim stitch, holes to drill is also no problem, the drum is suitable. Mangels triangular - kolo ocelové/chrom 10.0 x 15 - PCD 5 x 205 mm 1ks.